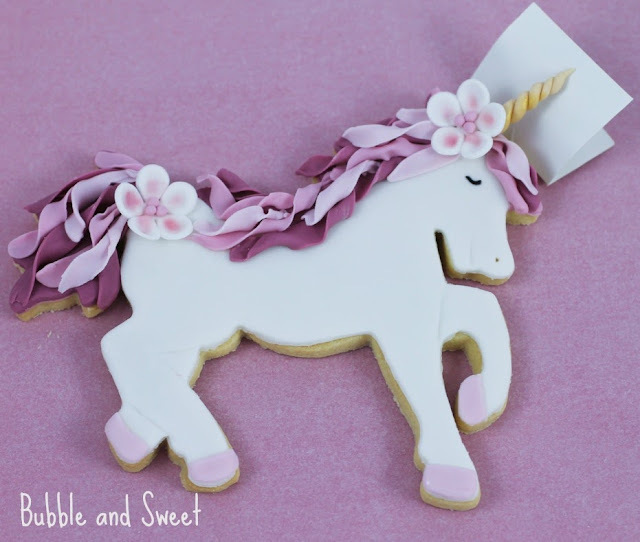 I have been playing around with cookie designs for the girls birthday parties and this seems to be a bit of a favourite for Sweet. 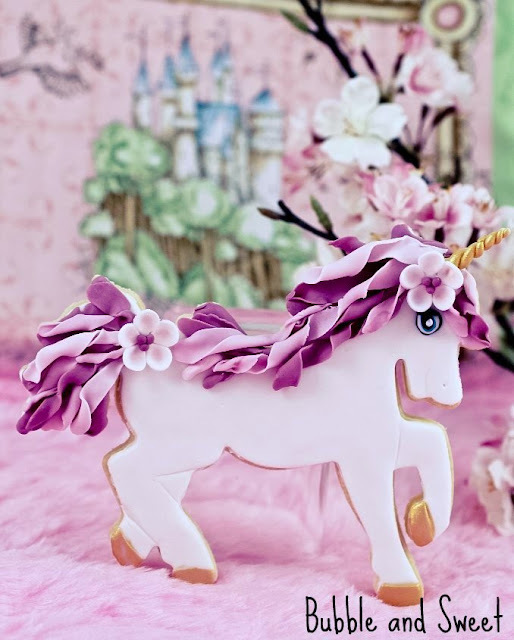 I guess who doesn't love unicorns, plus ombre pink with touches of gold, it's a magical combination. 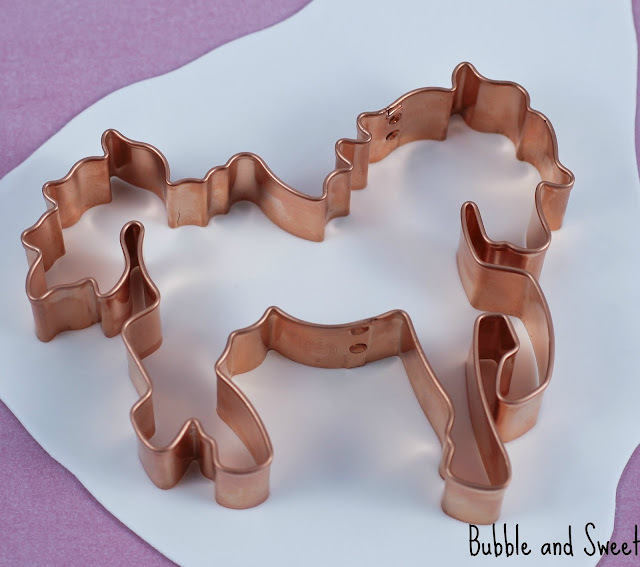 If you follow me on Instagram you would of course have seen the pretty copper horse cutters as soon as I bought it and lots of progress pictures of me making the cookies along the way. On facebook we had a vote - pink or gold hooves, for which gold won quite easily. Although I'm still undecided as a number of people told me the actual magic is in the horn so it should be the only gold part. I hope you love these cookies as much as my kids do. 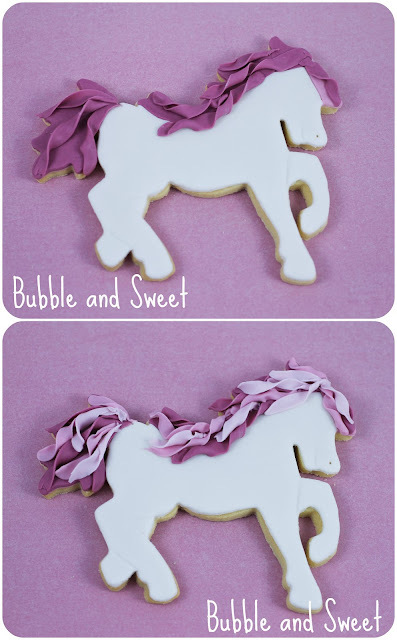 Check back in around a month's time for Sweet's magical birthday party table (which will feature these cookies). Plus next week I will have some of Bubble's 9th birthday party celebrations up. 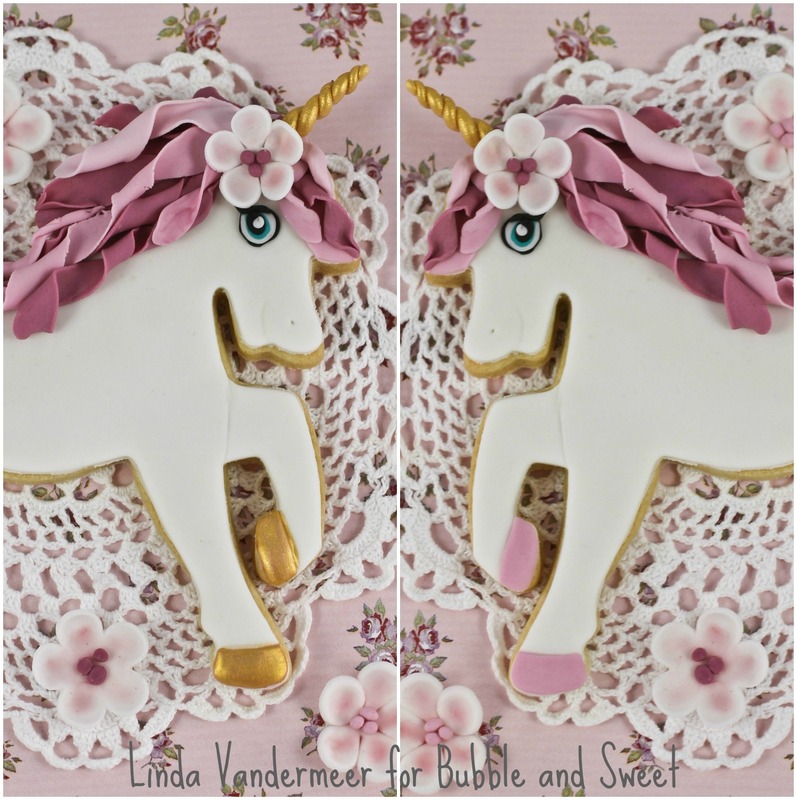 My cookie cutter was from Ecrandal but you can use any horse or unicorn cutter you have on hand for a similar cookie. 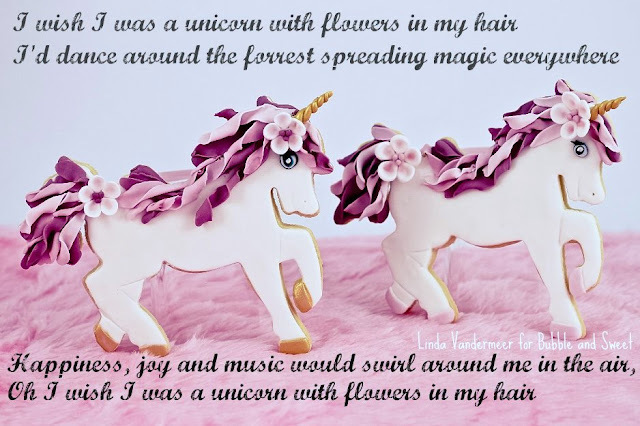 *first and last line of poem inspired by 'I wish I was a punk rocker with flowers in my hair' by Sandi Thom. CLICK on the picture below for the video tutorial otherwise continue to read for written instructions. ^fondant dries out quickly, when not in use store in an airtight container or ziplock bag. To use fondant knead until pliable and smooth and roll out on a workbench dusted with cornflour (cornstarch). 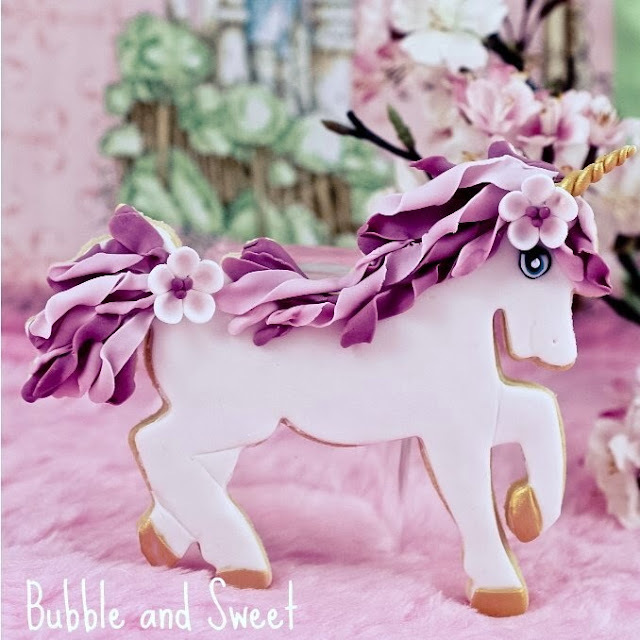 *You will need dark dusky pink, medium pink and light pink fondant for the unicorns tail and mane and dark ivory fondant for the unicorn horn and hooves plus a very small amount of black and teal for the eyes. The day before decorating colour all the fondant and make the unicorn horns. To make the horn roll out 2 pieces of the dark ivory fondant into thick ropes and then twist together. 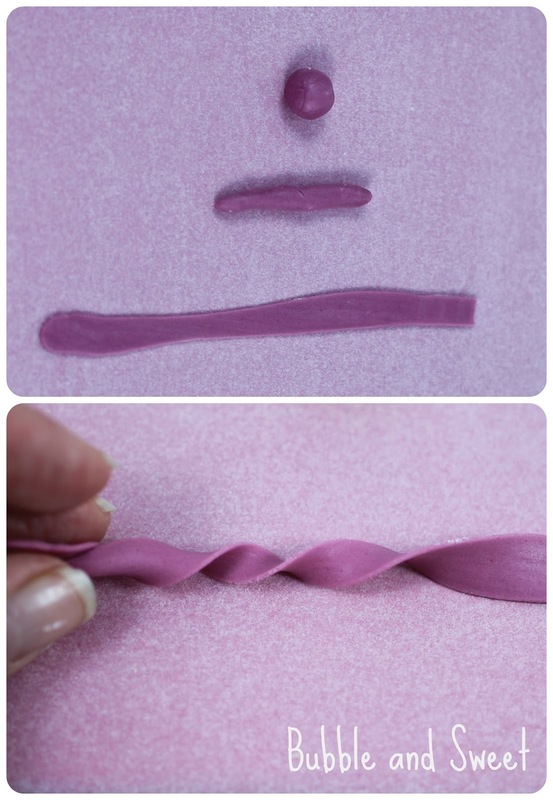 Using the palm of your hand roll until the desired width, you may need to stop and retwist every now and then to ensure the horn has a tight swirl. Cut to desired length and twist the end until it is has a thin sharp point. Using the cookie recipe and instructions below cut out and cookie horse cookies, allow to cool. Knead white fondant until smooth and pliable. Dust workbench with cornflour (corn starch) and roll out fondant until quite thin then using the horse cutter cut out a fondant shape. 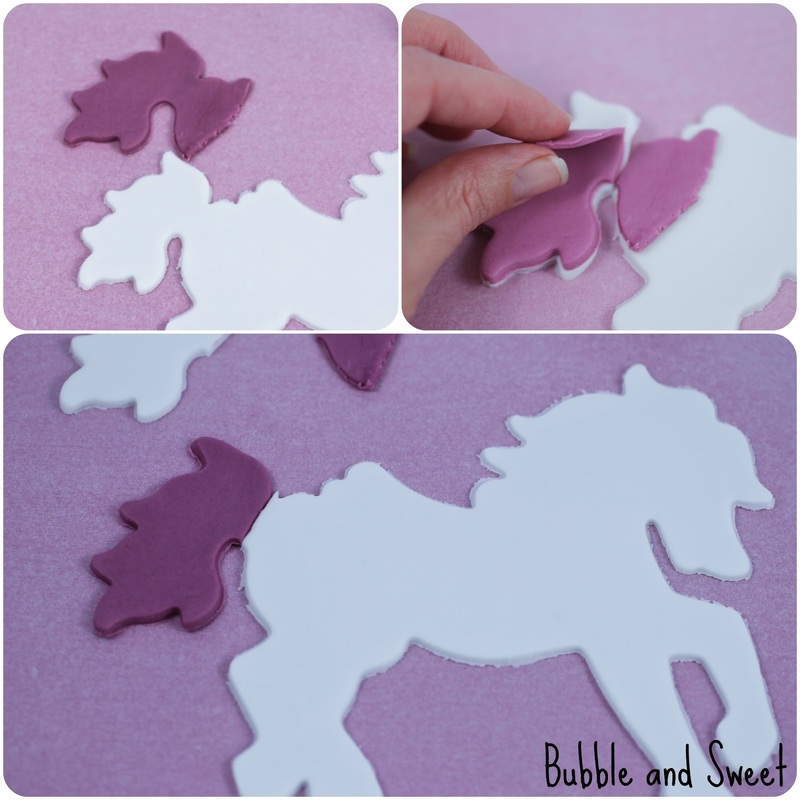 Roll out some of the darker dusky pink fondant and cut out a horse shape, you actually only need the tail and mane area. Roll out a small amount of the medium pink and cut out the horse head. 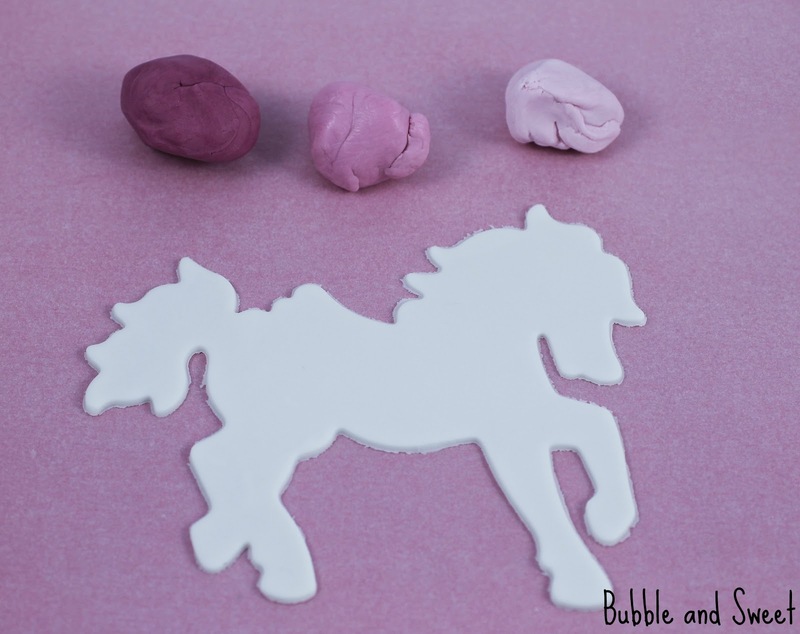 Place the darker dusky pink over the top of the white horse cut out and cut a line across where the tail meets and also along the back of the horse for the mane. See picture for example. Do the same for the medium pink to cut out the unicorn's 'fringe/mane'. Brush water onto the cookie and adhere the fondant, use the rolling pin to smooth the fondant into place. Take pea sized amounts of the dark dusky pink and roll between your palms into a thin rope, then use the rolling pinto flatten into a long ribbon. 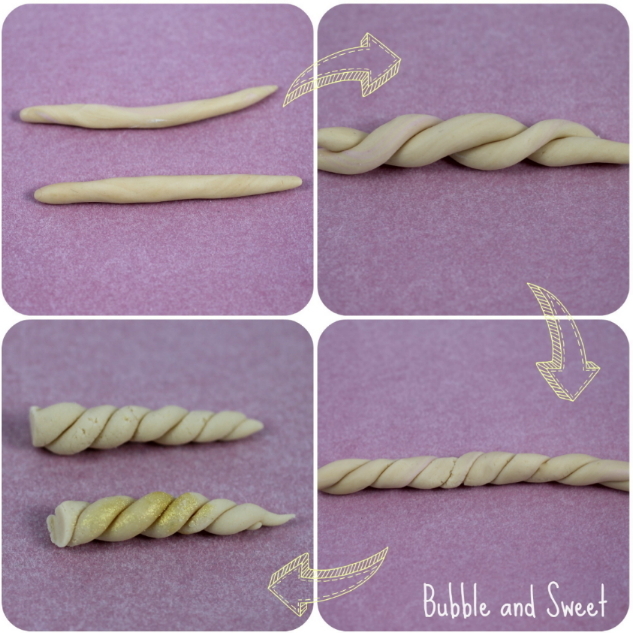 Twist each end of the fondant ribbon in the opposite direction to make a flowing corkscrew swirl. Place onto the cookie tail area and use a small amount of water to adhere in place. Use the sharp knife to cut any excess off. I adhered around 3 on the tail and 5 on the mane area (see picture). Repeat the process with the medium pink and then the light pink until the mane and tail appear full.. Fold a small piece of cardboard into a V to act as a support. Mash a very small amount of fondant with water to make a firm glue past and adhere the horn to the front mane part, move the cardboard support under the horn. 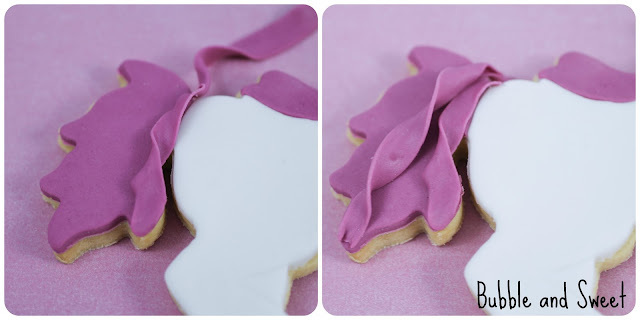 Add a sugar flower on top of the horn (using the fondant water glue) and where the tail meets the body. Decide if you are having pink or gold hooves and roll out that colour fondant. Use the horse cutter to cut out the feet area and use the sharp knife to cut out hooves. Adhere to the cookie with a small amount of water. Add eye detail, you can just draw on an eye with edible black pen. 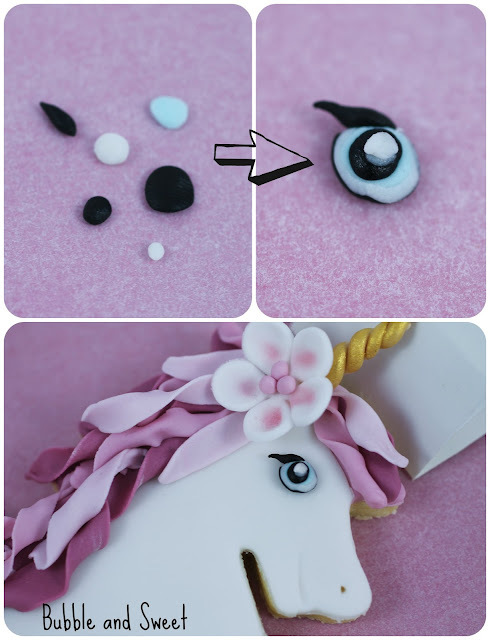 Other wise use a small amount of black, white and teal fondant to make an eye by pressing the colours into small rounds, see picture for detail. If you are having gold detail, mix the edible luster dust with a little rose spirits and paint onto the horn and hooves. Allow to dry until set and then store in airtight containers for up to 3 days. Unless stated otherwise, the above pictures and post are original works and the property of Linda Vandermeer. Oh, my, what little girl, or big girl, wouldn't love getting these cookies for her birthday? They are really beautiful. I really love how you created the main and tail. Pinning! 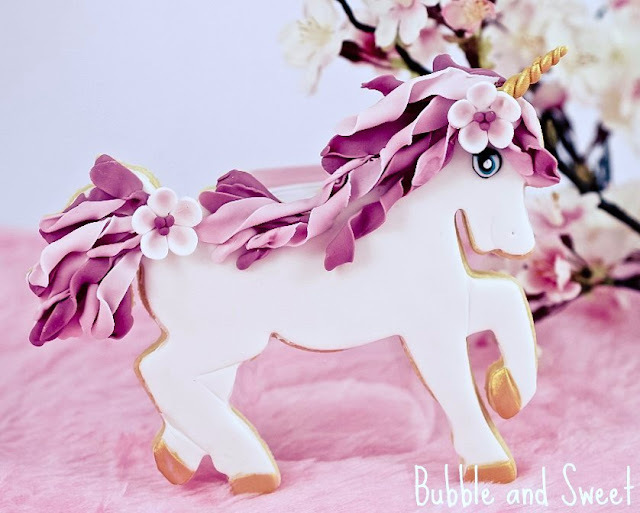 These are the most beautiful unicorns I've ever seen - and I've seen a lot! Now I wish I was a unicorn! This is amazing!! My daughter would just die! Hi Linda, how much fondant would you need to make this? You said your Sugar Cookie Recipe (makes 12 large cookies) so, for all 12 cookies, how much fondant would you say you used? Thank you Linda for your very detail instruction. 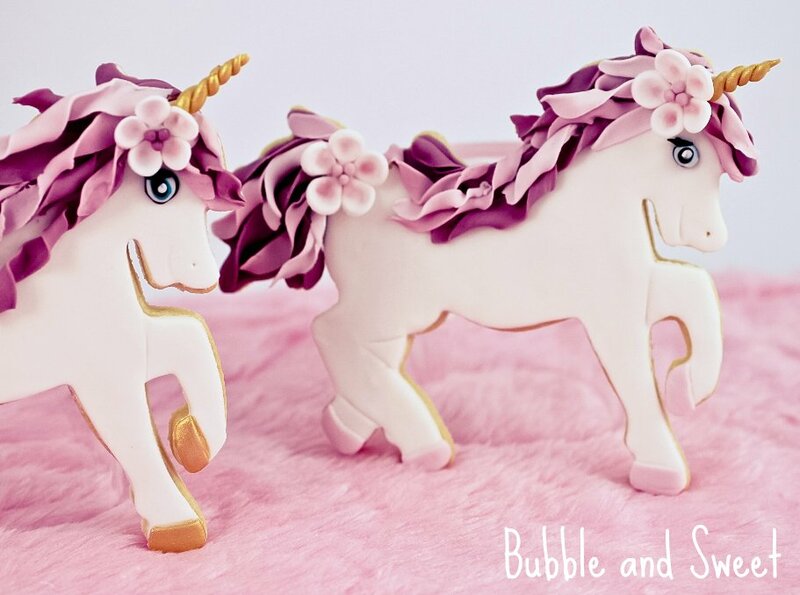 I tried this for my little one's 1st birthday early this Sep and they were such a show stopper :) and it was my first time to play with fondant and also cookies. 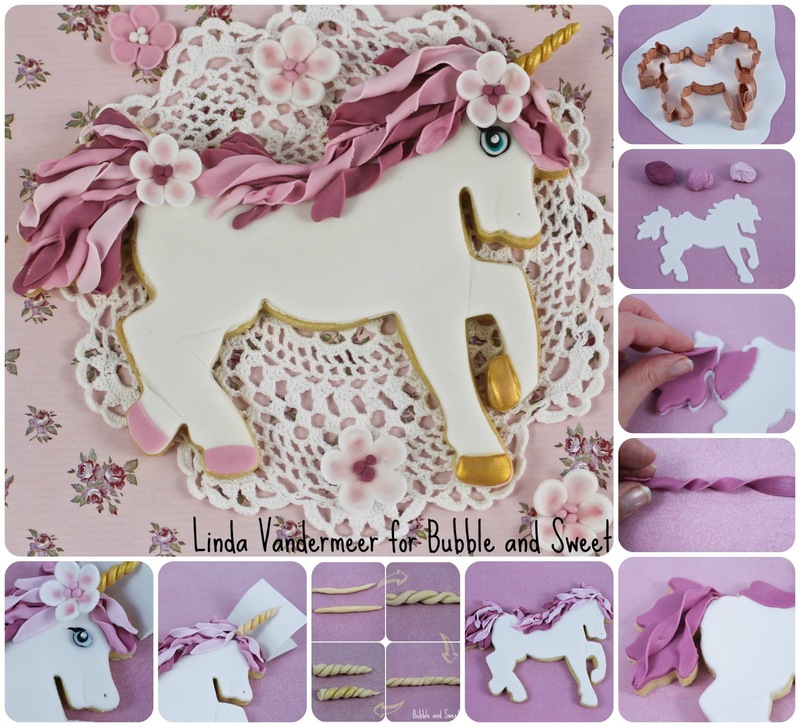 So this is not only GORGEOUS, it is also easy to make! You nailed it! Thank you so much! 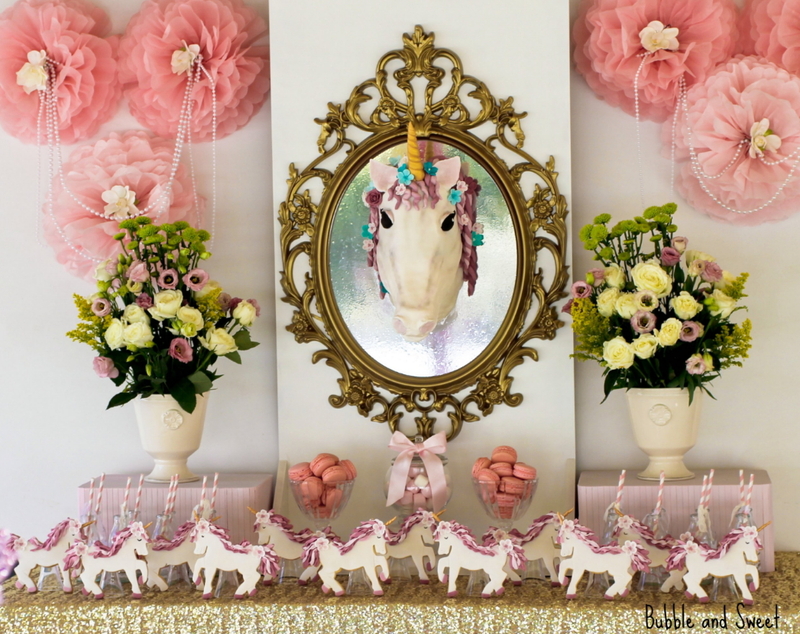 How wonderful, the cookies look great and the whole party for your sweet daughter is beautiful. Thank you so much for sharing with me.